Enjoy an expansive view on the Galaxy A8 with the Infinity Display. Taking spectacular pictures on the Galaxy A8 is as simple as tapping the shutter. Whether out at night or captured in the dark, you'll catch the scene plainly with the improved low-light capability on the Galaxy A8's rear cam. 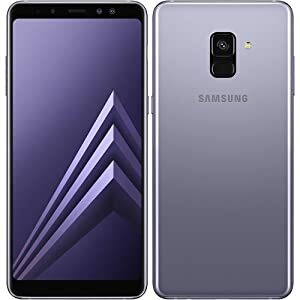 4G LTE Dual SIM ; 3G & 4G work with AT&T and T-Mobile ; DOES NOT work with Sprint, Verizon, U.S. Cellular and all other CDMA carriers ; LTE compatibility: This is international stock, varies per carrier (ensure to check with your carrier before purchase) Exynos 7885 Octa-core (2.2GHz Dual + 1.6GHz Hexa) CPU ; 64GB ROM, 4GB RAM ; Supports microSD, up to 256 GB (dedicated slot) ; 3000 mAh battery. Main Camera: 16 MP, f/1.7, phase detection autofocus, LED flash; Front Camera: Dual: 16 MP + 8 MP, f/1.9. 5.6 inches, Super AMOLED capacitive touchscreen, 16M colors. Package Content : Samsung Galaxy A8 2018 (SM-A530F/DS) , USB cable , Earphone , Ejection pin , USB power adaptor , Case , Quick start guide. PLEASE NOTE: this is an international version of the phone that comes with no warranty in the US.